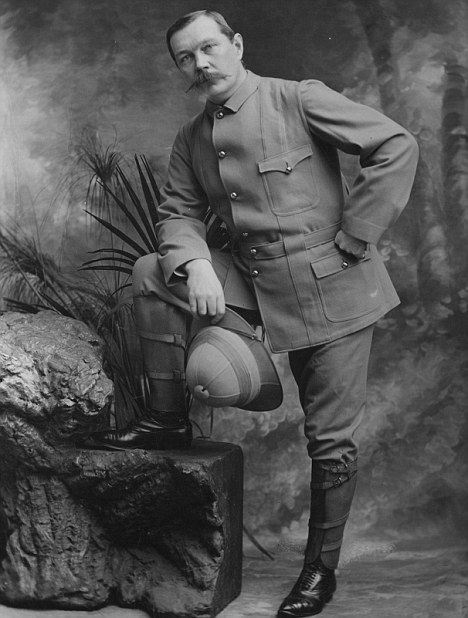 In the spring and early summer of 1900, the Literary Agent, Arthur Conan Doyle was volunteering at a field hospital in South Africa during the Second Boer War. Serving as a volunteer, Doyle would not be eligible to earn any of the British campaign medals that were available to others. Three versions of the Queen’s South Africa Medal can be found. Initially, the reverse of the medal featured the dates “1899” and “1900” just below the laurel wreath that Britannia was holding in her right hand. 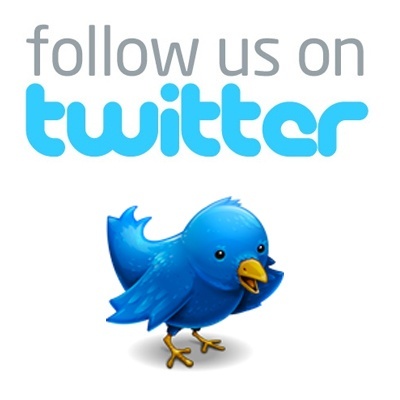 Initially, the war was expected to be rather short. Unfortunately, that was not the case as the war lasted into 1902. After about 50 medals had been awarded, the remaining medals had the two dates engraved off. 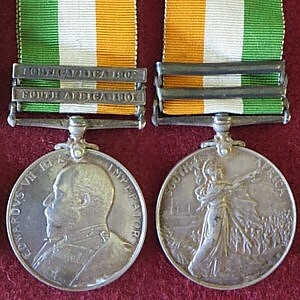 This is considered to be the second version and the medals can often be found with “ghost” dates remaining. 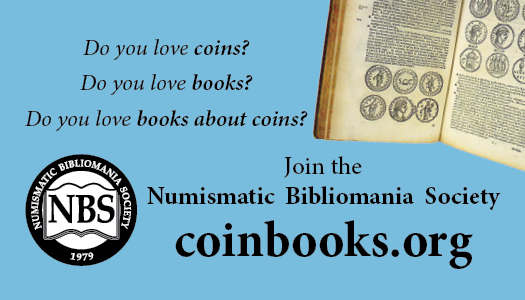 The third version were struck with new dies that had no dates on the reverse. Approximately 178,000 medals were awarded to all British forces who served in South Africa from October 11, 1899 up to the end of the war on May 31, 1902. The 36mm medal can be found in both silver and bronze and there are 26 different clasps that were authorized to be attached to the ribbon. 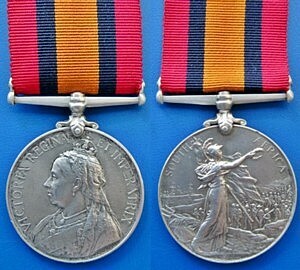 With the death of Queen Victoria in 1901, new medals were needed for King Edward VII. The King’s South African Medal was the first struck during his reign. The award criteria was tightened for this award, recipients had to serve in South Africa in 1902 and serve 18 months there. 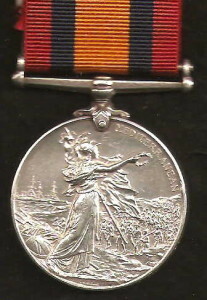 As a result, most recipients of this award also have the Queen’s South Africa medal. Two clasps were authorized for the King’s medal, for service in 1901 and 1908. This medal is only known in silver and is slightly larger, 38mm, than the Queen’s medal. 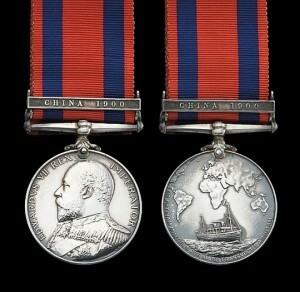 The 36mm silver Transport Medal features King Edward VII on the obverse and the HMS Ophir on the reverse. This medal was awarded to the crews of merchant ships that transported troops and equipments to either South Africa for the Second Boer War or to China for the Boxer Rebellion. Two clasps were authorized, one for each destination. Initially, this medal was to be awarded for future military actions, but was never issued again.